Book Review: The Influential Author : Executive Leader Coach @ dbkAssociates, Inc.
Long ago I learned that the more I studied a topic, the more complexity I uncovered and the more I discovered what I didn’t know about that topic. 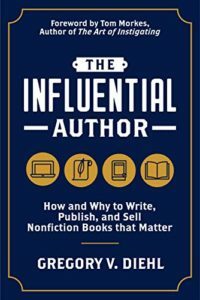 Gregory Diehl’s seminal book, The Influential Author: How and Why to Write, Publish, and Sell Nonfiction Books that Matter, taught me just how much I didn’t understand about writing and self-publishing a nonfiction book. It should be easy, right? I sit at my computer and type out what I would say if we were face-to-face chatting about the topic of interest. Diehl quickly disabused me of that idea and set me straight on what it takes to author a book that matters. At the same time, he inspired me to write that book I haven’t gotten around to writing. Everything about Diehl’s book exactly demonstrates what he is inculcating. The organization of the content is no exception. The body of his work comprises seven parts: Philosophy, Strategy, Creation, Refinement, Presentation, Promotion, and Reward. He then adds a conclusion to draw all the content together and remind us what we have learned. Diehl packs each section with practical how-to information as well as the reasoning behind the directions given. The front material includes a wonderful section titled, “Questions to Help You Get the Most from This Book.” Those questions did indeed help me watch for answers along the way. They kept me focused on my reasons for exploring authorship. Is the content of your book unique? Are your tone and presentation more effective than other authors? Why are you inspired to bring your message to the world? Who needs to read your message and why? There are many more questions waiting for you in that section. The back material—Appendix: Resources, Acknowledgments, About the Author—proves to be just as informative and useful as the rest of the content. I’m sure I will be referring to the Appendix many times in the future. It is chock full of links to resources for each phase of my writing project. The author’s writing style is informative without being overly didactic. He entertains with personal examples of success and failure. Diehl is personable, relaxed and yet authoritative in his presentation. The result of this presentation style is that I believe I have the good, the bad, and the ugly when it comes to writing, publishing and promoting a book. I will go into this project with my eyes open. For me, the bottom line is reading this book built my writing confidence and was time well spent. I will undoubtedly read it again. I intend to have it by my side as a guide and resource when I embark on my writing adventure. Diehl’s is a must-read book for anyone who is blogging (who isn’t these days? ), writing articles for social media, or embarking on a book project. A strong 5-star rating!